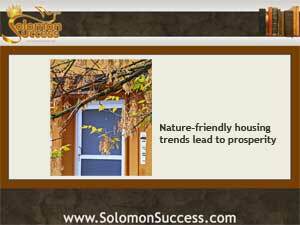 Solomon Success > Blog > Going Green: the Natural Choice for Wise Investing? Going Green: the Natural Choice for Wise Investing? In King Solomon’s many teachings about the importance of wisdom and right living, he often turns to the natural world for examples. ”Deliver thyself as a doe from the hand, and as a bird from the hand of the fowler,” he says in Proverbs 6:5-6. “Go to the ant, O sluggard, and consider her ways.” In today’s investing world, as in Solomon’s day, an awareness of the natural world can lead to prosperity, as “green” approaches in housing lead to greenbacks for investors. Green is the shorthand for a wide range of products, services and strategies that reduce damage to the environment and save energy. In the housing industry, opportunities for green building and upgrading can range from land management and building plans for new homes to installing new, energy conserving ductwork in an older home. Landscaping, too, can be a green investment. Planting shade trees to offset heat or xeriscaping to reduce water use also enhance a home’s green appeal. Whatever the strategy, though, environmental experts and economists agree that green is in – and the desire to at least appear environmentally aware is driving decision making in many areas of the economy. According to Green Real Estate Investing News, that’s especially true in the housing market, where green-certified new homes may sell for 30% more than their traditional counterparts in more affluent markets. Existing homes with a few green upgrades like solar paneling or energy-efficient appliances also sold for more. In the rental market, too, green housing generates interest. Rental housing is in high demand now, fueled by new kinds of renters – affluent professionals and retirees who’ve made a decision not to own a home. These groups, educated and often socially and politically active, may seek out rental housing with environmentally friendly features too. The benefits of going green aren’t just for new home starts. A variety of companies and even state and federal programs offer incentives and support for home owners seeking to install energy saving devices and make green upgrades in existing homes. These expenditures also qualify as tax-deductible improvements and maintenance. Is Your Christian Investment Green?